Candy corn is the traditional Halloween candy, but I am a much bigger fan of Reese's pieces and they come in pretty great Fall/Halloween colors too. Leigh Ann took advantage of their fun color and their peanut butter flavor when she added them to this Halloween caramel corn, also known as peanut butter chocolate & butterscotch white chocolate caramel corn. If that won't satisfy your Halloween sweet tooth, I don't know what will! 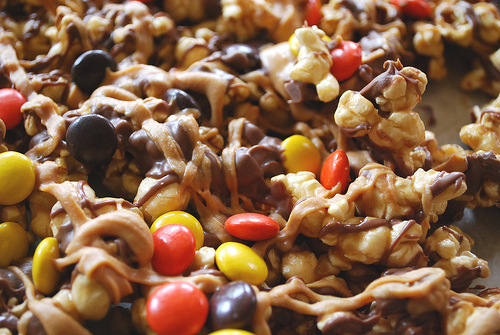 You can get the recipe for this dressed up Halloween caramel corn over at Your Homebased Mom.